Over the last ten to fifteen years, dental tourism has become very popular due to the escalating costs of dental procedures. Dental tourism involves people traveling internationally to have dental work done at a less expensive rate than they can get done in their own country. Where Should You Go for Dental Tourism? It should be noted that this 50 to 80 percent savings that can be made by traveling to Thailand for dental work includes the cost of airfare, accommodations, and other travel expenses. Therefore, in addition to saving a ton of money with dental tourism in Thailand, a dental patient has the added benefit of visiting one of the most beautiful tropical countries in the world. The number one driving force behind the explosion in dental tourism to have their dental work done is incredible amounts of money that can be saved. The cost of dental work in many countries, particularly the United States and the United Kingdom, is skyrocketing to the point that most people cannot afford to have their dental work done. This includes most of the middle-class. Many Americans who can’t afford much needed dental procedures put off having their dental work done to the point it becomes an emergency and they end up having to go to the emergency room. In fact, this happened to more than one million Americans last year alone. The situation has gotten to be a crisis and people are absolutely desperate to find a cheaper way to have their dental work done. A survey by Consumer Reports indicated that the average out of pocket cost for a single filling in the United States was $288 dollars. According to the same source, the average out of pocket cost for a tooth implant was $3,938. It has become quite common to go to the dentist for an evaluation and be handed an estimate that ranges in the thousands of dollars. For just four dental implants and one simple filling, the average price tag at an American dental office would be more than $12,000. The same work in Thailand would cost about $3500 or less. How Does Thailand Dental Offices Compare to American Dental Offices? Dentists in Thailand often receive their training by attending an American dental school so they have the same modern training that American dentists have. The dental clinics in Thailand have the most modern up to date equipment and most are sparkling clean. 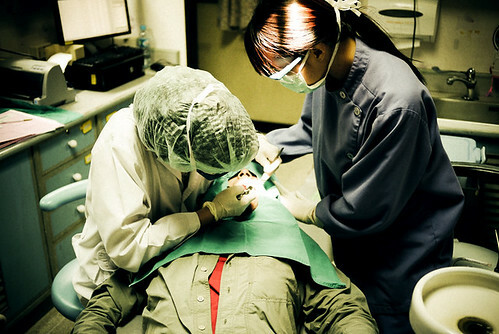 The staff in Thailand dental offices that participate in dental tourism speak English. In fact, many of these clinics are actually specifically set up to tailor their services to English speaking dental tourists. Many Americans who participate in dental tourism in Thailand report that they actually have to pay less than what they were originally quoted by a Thailand dentist. Dental tourists need not worry about what would happen if a rare complication occurs because they can purchase dental tourism insurance that will protect them in such an unlikely event. Dental tourism insurance is very affordable and well worth it for the peace of mind it brings. Dental tourism insurance will pay for any unplanned emergency procedures that have to be performed during the procedure in Thailand and also to fix any problems once the dental tourist returns to their country of origin. How Do I Participate in Dental Tourism in Thailand? To participate in dental tourism in Thailand, there are travel agents you can use that specialize in this field. They are aware of all the best dental clinics in Thailand that have been fully vetted. Some travel agents that facilitate dental tourism in Thailand have personally visited the dental offices they recommend. In summary, dental tourism in Thailand can save you as much as 80 percent of your dental costs and almost every dental tourist in Thailand saves at least 50 percent with the average being between 60 to 70 percent of what it would cost for the same procedure(s) in the United States. In addition to the incredible financial savings, you can also take the opportunity to explore the natural beauty and culture of Thailand. What an amazing side benefit!